This project aims to provide players with a variety of robotic, structural, and utility parts to enhance their unmanned (or manned) space missions in KSP! All parts have a unified design, with a near-future look. What can you do with Infernal Robotics and the Model Rework? The Model Rework & Expansion is divided into three packs, allowing players to choose the parts they have installed. All parts in the mod have been designed around the use of TweakScale, so although it's not required for them to function it's highly recommended to get the most out of them. Due to the special nature in which robotics contraptions must be built in KSP, each robotics part has yellow markers indicating the attachment node you should use to attach the part down. If you use the opposite one then parts will appear to float when you try and move them. This pack contains a basic selection of robotic parts and accompanying structural parts in various sizes to give players a taste of what can be achieved with robotics. This pack contains specialist rotational robotics and structural parts to allow for more interesting craft designs than are possible with the Core Pack alone. Note: This pack has yet to be updated to KSP 1.0 due to additional dependencies needing updating. As such RoboStruts and the Utilitron Sampler will not work. Movatrons should be unaffected. This pack contains a number of non-robotic parts to offer more interesting gameplay when using robotics parts from the other packs. Note that this pack includes ActiveStruts (Source) and TweakableStaging, and requires Kerbal Attachment System to unlock some recommended features. TweakableStaging is used for the RoboStrut parts to allow them to be added and removed from the staging area, so can be deleted if you do not wish to use this functionality. (Coming Soon) Mecatrons - Rotatrons with a number of wheels around the outside. When 4 or more are used together they allow for omni-directional motion! Utilitrons - A set of parts to use on the end of robotic arms or legs. Specifically there is a Landing Foot, KAS Magnet, KAS Grappling Hook, and a brand new Unmanned Surface Sampler, allowing rovers to take the same samples that kerbals do! - Added Movatrons, a set of four wheel parts with integrated rotational joints allowing for the direction a rover travels to be changed on the fly. Parts just fall through the floor! This is a known issue with the collision of the parts, that was introduced with the release of KSP 1.0. This is being fixed but will take a fair amount of time. If your parts look like this image (or the same pattern but glowing yellow) it means that texture replacement isn't working. To correct this shut down the game and delete PartDatabase.cfg in the KSP root directory. All my parts appear black! 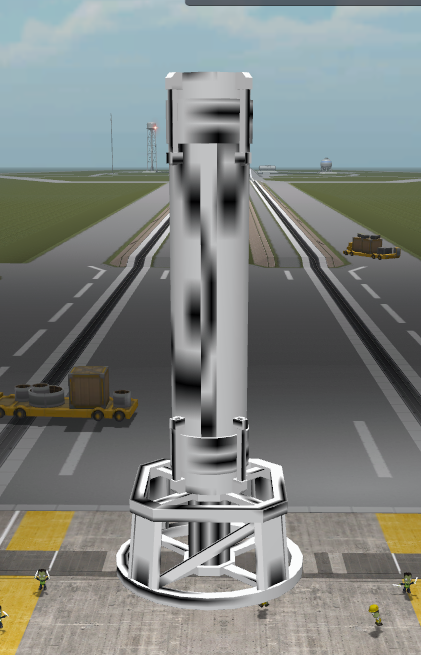 This is caused by the Active Texture Management mod, which is having a few issues with KSP 1.0.x. The devs are aware of the issue and will hopefully come back with a fix soon. 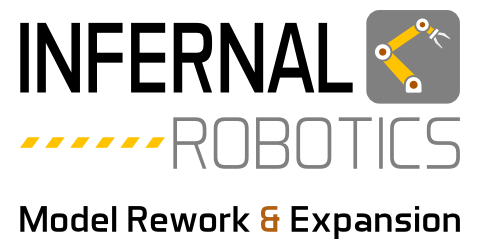 In the meantime this has been suggested as a possible solution: http://forum.kerbalspaceprogram.com/threads/65365-WIP-MSI-s-Infernal-Robotics-Model-Rework-%28Updated-28-04-2015%29?p=1902110&viewfull=1#post1902110. If that does not work then pester the ATM devs over in their release thread to get it sorted: http://forum.kerbalspaceprogram.com/threads/59005-1-0-Release-5-0-April-28-2015-Active-Texture-Management-Save-RAM! Github can also be used for making part requests, but if you do I ask that you provide a reasoned description with concept art / reference material of the part you'd like to see added. Note that adding a request gives me no obligation to create it (I'm doing this mod as a hobby in my spare time after all), but it does mean I'm more likely to consider the idea or revisit it at a later stage in the mods development. Does this completely supersede all of devo's models? Over time, yes. It's likely that I'll end up releasing parts in stages, whilst leaving the current ones intact to avoid save-breaking. I just want to chime in that I did a good few of the models (tall hinge, rotatron, closed and open hinge, etc) it's what I used to cut my teeth on modeling. I will say that ZodiusInfuser is getting us in the right direction with the look and feel. With the design redo and me rewriting the code this will be an awesome release. Is there some plan to have a single hinge for each type that can use tweaks to be right angled, or any angle within its range for that matter? Seems like it would increase flexibility of use and reduce IR's inventory footprint in the editor. Not sure yet. It's something I will be looking into with the plugin. This thread is more about the rework of the models and textures. Any questions about the plugin can be thrown at me in the release thread. Sorry mixed up which page I was on. Had multiple ones open. I'll it post where it belongs. OMG! When can we get it? This is just gorgeous! Not for a long while yet. I suspect the structural elements will be first though, as these are the parts I've spent the most time on. Yay! The only thing preventing me using IR was the weird modelling and texturing, but from what te pictures show these new models are gonna be awesome! Best of luck to you. nice, with all the Vtol engines, mounts popping up we only need a good script that could actually keep the a-symmetrical ships level! Here you can see four different styles of structural segments, to suit almost any application . You've got 0.5m and 0.25m wide truss segments, and 0.25m and 0.125m diameter tubes. Lengths range from 0.625m for the smallest segment, to a jumbo 6.25m! Also, a number of adapters between them and 0.625m parts, because I could . Note that I've just applied solid colours to the textures for the time being, until I can test things out in-game. These look awesome. The tubes were especially needed. Can't wait! If you're taking requests, I have a feature for you to implement, or pass along. It would be nice to allow each IR part to be able to function outside of a group. The point of a group is to have multiple robotics moving at the same time, however if you only need one per group, the whole concept of a group is pointless. I think it would be a lot better if there was no group requirement for the robotics menu in the VAB/SPH. You're best to suggest this over in the release thread, as features like that are Sirkut's area (unless he see's it here first). This thread is just for showing model work, and for discussing new part ideas. Thank you so much for doing this guys! DR is so useful anyway, but now it will be perfect! Only thing I would suggest is to cut down the number of parts. What I didn't like about IR is that it has too many parts, most of them never used. In dromoman for example I made just 3 limb lengths, 0.75, 2, and 3 meter, combining these you could get any other length and you really don't need bigger than 6m since things get really wobbly over. Your parts look really good btw =) Keep up the good work! The DROMOMAN mod was one of the things that inspired me to start this venture. The recent videos you did of station rearrangment showed that robotics has a useful role within a serious space program. I encourage everyone to try it out to get a sense of where IR is heading! I agree that IR has a lot of parts, but I doubt this will be reduced in the rework since many new concepts will be added. I will do my best though to avoid having redundant parts where possible. I forsee IR to be like B9 in some ways, many varies parts, all having a use for someone at some point. When you do the gantry rails, I'd like to have an extremely long version, for use on stations. Then we could mount robotic arms to them and such. it's 'Supercede' What do they teach you in Uni? I'm glad Zodius is re-doing the models. They were not models we spent alot of time or effort on, they born out of necessity, with no one else supporting DR, and were simply to get something new out to play with (and Sirkut needed something to start learning modelling on). I do intend to add several lengths of gantry, but not sure what the maximum will be yet, maybe 5 or 6.25m to match the largest truss segments. We'll see, as I'd really like to make decent cranes with them . Thanks Devo! I hope I can live up to the ambition both you and Sirkut had for this mod. I may have shown one or two before in the release thread (can't remember). The Extended Joint (working title) is certainly new as I finished modelling it 10 minutes ago . 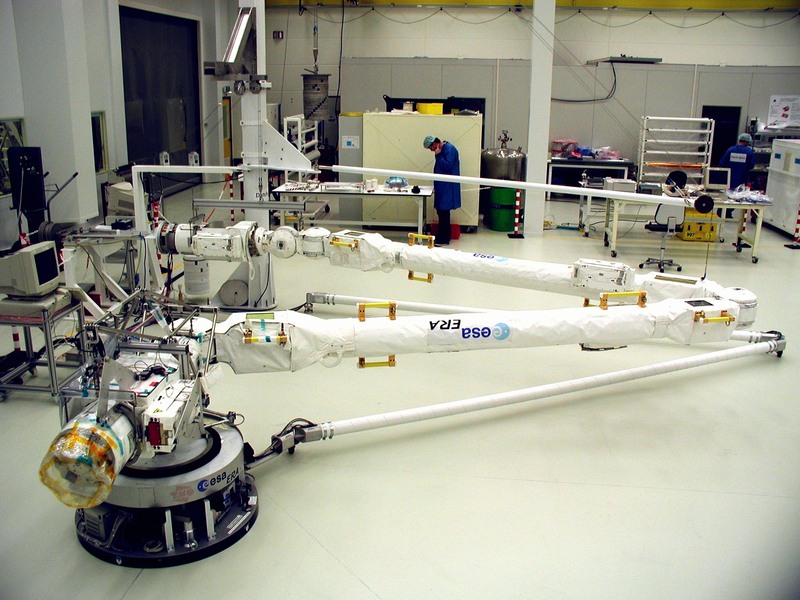 It along with the earlier tube segments are inspired by the ESA robot arm. I am looking forward to seeing the finished models, I agree with all the comments, here, the current set is completely all over the place, there was absolutely no rules set between Sirkut and I, so textures don't match and in general the parts don't match, but they do serve a function and really I suppose that's what we were focusing on while Sirkut got his head around the mass of code that is DR, most definitely out of my league that one. Many of the parts I made were more to suit my own projects and I am using IR as a supplement for those things I just can't do. Essentially my interest in Infernal Robotics was fairly linear. 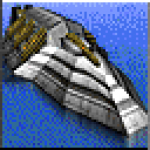 I needed a plugin that allowed me to attach things to animated objects and have them move with it - and this seemed the only solution (and appears still is the only solution to that modding issue) so for me, things like rotating VTOLS which I use on just about all my ships was where I put my focus. Sirkut pretty much did all the pistons and hinges, I just did a few rotatrons really and skinned some parts, so I didn't have that big a part in it really. As I said, Glad you are taking it up as the infernal parts I make sort of are really specific to my ships, and I don't really have the free time available to do everything I want, including a nice shiny stock set of IR parts that are not overblown. Damned robotics was nice and simple, a handful of parts but they were all so versatile.